Both programs are research intensive and pave a strong foundation for those on the pathway to the Higher Degree by Research programs i.e. Doctor of Philosophy (PhD) and Master Degree by research (MPhil). This research year of study allows students to undertake practical problems from a broader intellectual perspective. The major component of the program is the investigation and writing of a research report that is unlike anything experienced at the undergraduate level or within a coursework based Masters degree. This program provides a structured introduction into the conduct of business and economics-related research at an advanced level. Participation in the program will develop technical and analytical skills, and reinforce critical and independent thinking. 4. be a committed scholar and practitioner able to collaborate with others to foster social responsibility. To add on, students who complete the program with first class or second class upper honours grade may be permitted to enrol in the Doctor of Philosophy (PhD) program without having to complete a Masters Degree by research. The Bachelor of Business and Commerce (Honours) offers the opportunity to undertake advanced study within the disciplines offered by the departments of the School of Business. This program is especially recognised in the European region and Australia. Those who embark on this program are mostly students who have completed their undergraduate degree and immediately intend to pursue an additional year of research centred studies. The Postgraduate Diploma in Business and Commerce is designed to provide a structured introduction into the conduct of business and economics related research at an advanced level. The structure and objective of this program is similar to the Bachelor of Business and Commerce (Honours) program. However, it most often appeals to Masters by coursework holders who do not fulfill the research component requirement for entry to a Higher Degree by Research program i.e. PhD or MPhil. Complete the Bachelor of Business and Commerce at Monash University or an equivalent degree comprising of the major sequence in a business and economics related discipline (a minimum of 8 discipline units as part of an acceptable degree). Obtain a minimum 70% average grade over level two and three of the undergraduate degree in specialised area of business units. Successfully completed at least one (1) unit in statistics or econometrics as part of the undergraduate degree. Students must satisfy the minimum English language requirements of the University. Please click here for more details. Note: Due to the intensity of the program, no credit/unit exemptions can be granted. Intakes: Semester 1 (February) and Semester 2 (July). For upcoming intake dates, please click here. This unit aims to develop students' understanding of qualitative research, with specific focus on qualitative research philosophy, qualitative research design and qualitative research methods. This unit explores topics such as: paradigmatic approaches to research; research design; negotiation of access to research sites/participants; researcher ethics; methods of qualitative data collection such as observation, interviews, focus groups and non-intrusive data collection; methods of data analysis; issues of qualitative research validity; and qualitative writing. An in-depth introduction to quantitative research methods. This subject is one of two that together supply the research methodology skills and knowledge necessary for students to complete an independent research project at the honours level. It provides a comprehensive coverage of quantitative research methodologies. Topics include: survey studies/correlational field studies; forms of regression; analysis of variances; discriminant analysis; factor analysis; non-parametric statistics. Under the guidance of an academic supervisor, this subject allows a student to independently gain in-depth discipline knowledge in a selected area of business and commerce as a foundation to the completion of an honours project. The student will complete a prescribed list of readings, undertake further independent literature studies, and complete other learning activities and assessments considered appropriate for the selected field of study. Students work under the guidance of a supervisor to plan, carry out, and report on an original research project that addresses a significant issues in business; this research project is likely to have substantial practical outcomes or implications; as well, it is hoped that students and supervisors will publish the work in an appropriate journal. Competitive scholarships are awarded based on academic merits. Scholarships are considered only when the student has been accepted into the School. Students may be invited to an interview before selection. The scholarship application process is incorporated within the submission of formal application process. Applicants can indicate their interest for scholarship by completing the relevant field in the ‘Supervisory Form’. All applications will be reviewed by a dedicated committee within the School. The scholarship application outcome will be announced prior to the commencement of the intake. All decisions are final. Please visit http://www.buseco.monash.edu.my/about/school/academic for the list of academic members of the School. Certified True Copies (CTC) of documents can be done at the Research Office provided the original documents are brought along. Applicants should get the supervisor(s) to sign and date the proposal before submitting the formal application. 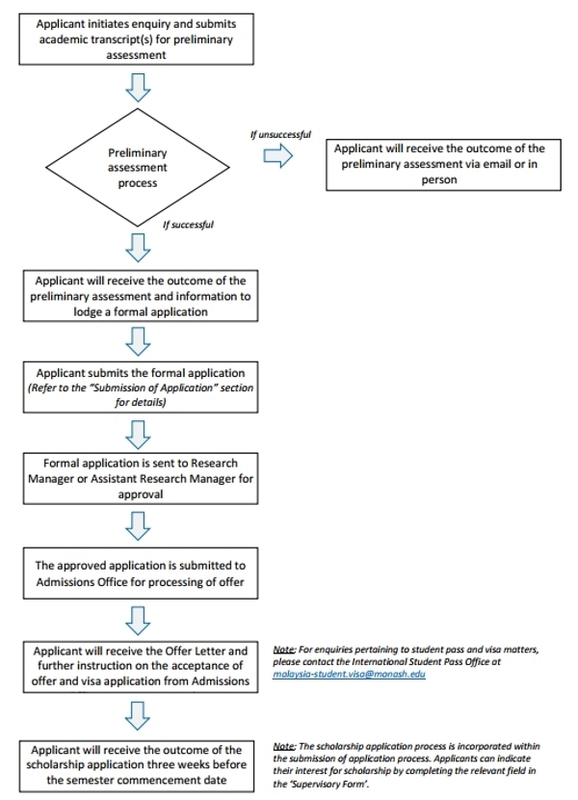 Refer to the ‘Forms & Guidelines’ header below for a copy of the application form, supervisory form, and guidelines for writing a research proposal. Operating hours : 9.00 a.m. - 5.00 p.m.